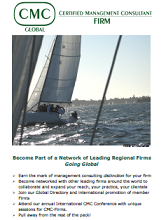 Having your firm join the CMC-Global Network as a CMC-Firm will put you in the company of a select group of regional firms looking to expand their ability to serve their clients outside their current region. Your expansion could occur by growing your own business or perhaps creating an alliance or partnership with another CMC-Firm in the new geographic area of expansion. Become approved, then use the CMC-Firm branding elements on your firm’s own marketing materials/channels – enhancing your competitiveness and distinction in the marketplace. Join a facilitated network of other high quality, approved firms, become engaged, share your insights, questions, and potentially leverage each other’s talent to expand your capacity to serve your clients’ needs beyond your current geographic operations. Be a part and have access to the global directory of CMC-Firms and have input into our global promotional strategies. Reinforce ethical standards and code of conduct to you clients. Reinforce your firm’s status and reach vis-à-vis major international firms. Commitment to provide feedback that enables professional growth of personnel involved in the execution of client engagements.